Hearing whispers of the ‘best steak in Singapore’, I slowly followed the clues and voices as fervently as Lois Lane trying to figure out who is Superman. This brought me to my next ‘steakout’ (hoho pun intended) after Salta Parrilla. I’ve been to Bedrock a good 3 times already, twice on my own and the last time on a media tasting. I’m probably going to try the entire menu sooner or later. You can observe a varying degree in photo quality, while the newer ones are way better due to my upgrade in equipment to shoot in this dim, warm restaurant. Bedrock Bar and Grill, hidden behind 313 Somerset, from the façade looks like a small outdoor bar in town, but as you are led further in, reveals a modern and cosy L.A style restaurant. Nothing too fancy about the decorum; a lot of lacquered hardwood surfaces, semi-circle sofa booths, dim warm lighting etc so let’s skip this and get to the good parts. 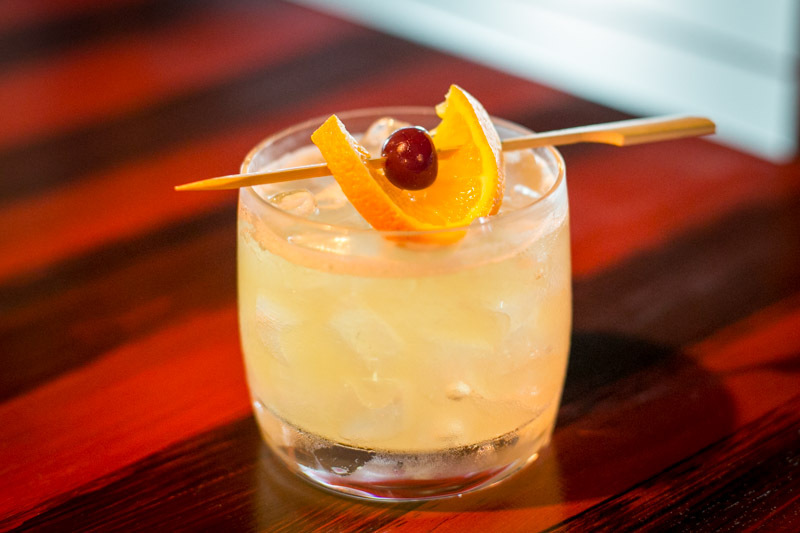 The famed Bedrock Whiskey Sour ($18), made with 12 yr old Irish Whiskey, simple syrup and fresh lemon juice. It doesn’t get any more basic then this and that’s the whole philosophy behind Bedrock Bar- the use of excellent fresh ingredients with minimal flavour additives. Very nicely balanced whiskey sour, showing just the right proportion of sour to sweet. It’s a good cocktail when you don’t taste the heavy punch of the base hard liquor. My date got a double shot scotch on the rocks Glenmorangie 12 y.o ($13 x2) if I recalled correctly. 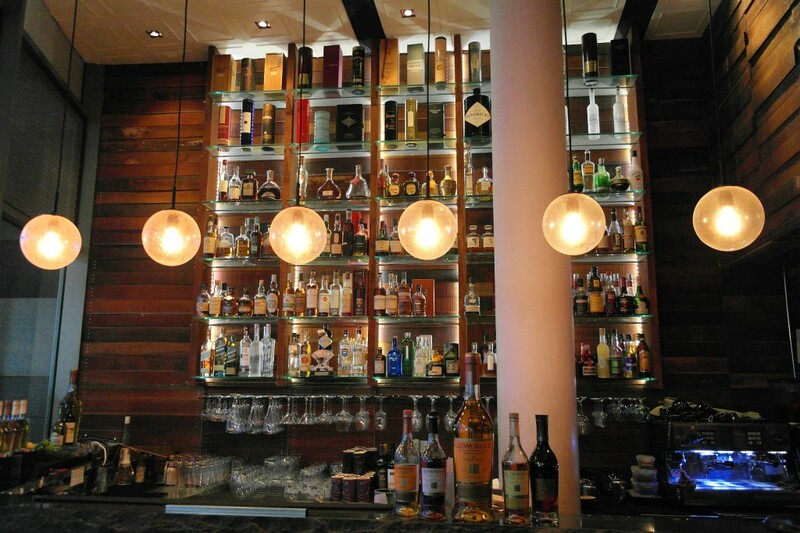 If you’re a single malt scotch aficionado, you can really go wild here with their selection, provided you try to drink away the number on the bill. Few people, not the sane ones, judge a restaurant based on how good the bread is. 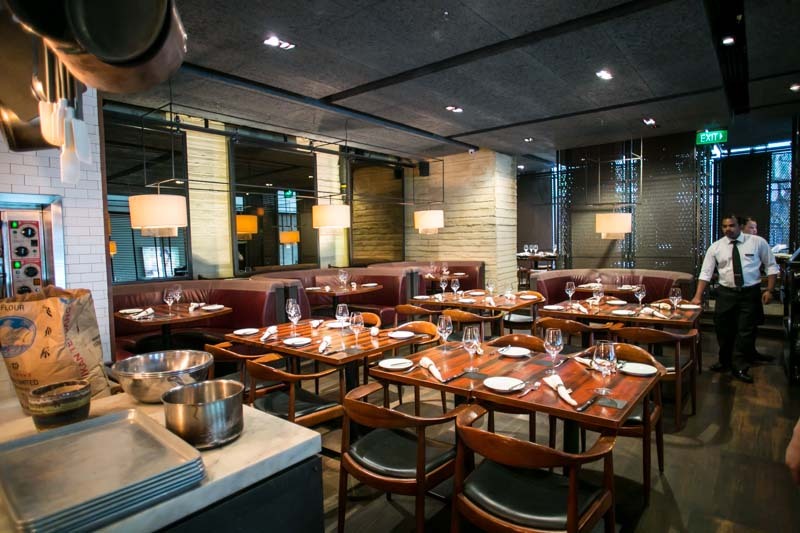 But the bread snob has its merits and decrees Bedrock bar and grill a top bread restaurant. 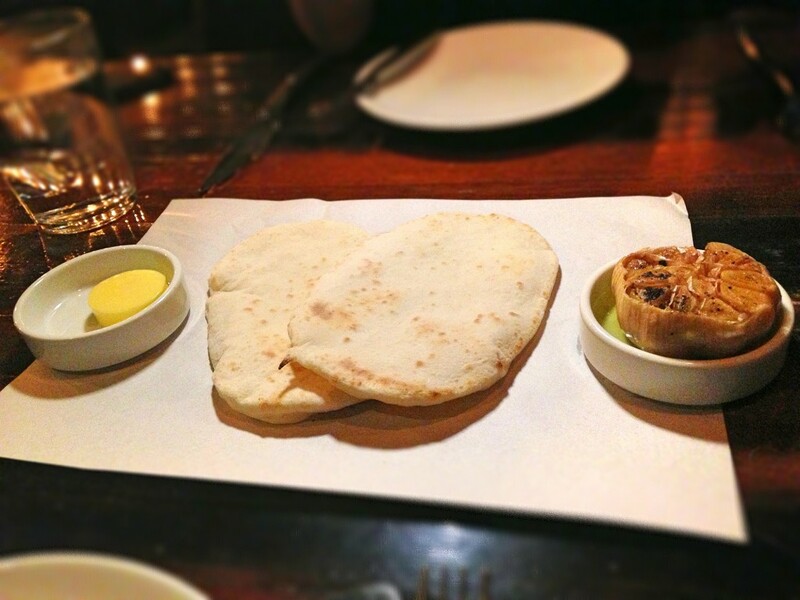 Bedrock serves Naan bread baked right inside the restaurant, served with garlic infused oil and butter. Freshly baked and soft as kittens, it was a discipline itself to resist the free flow of bread prior to our steaks. Soft breads are so much more palatable than rock hard breads that, like the Xbox One, have only one plausible use as a paper weight. 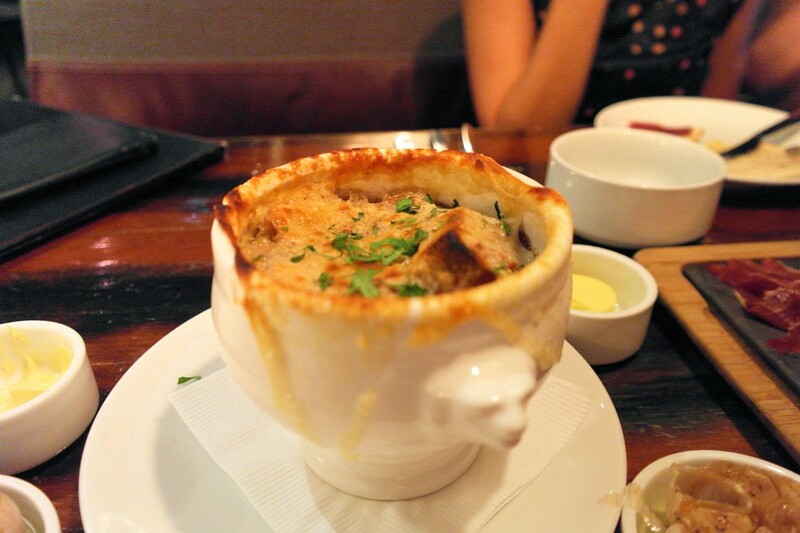 French Onion Soup ($16). 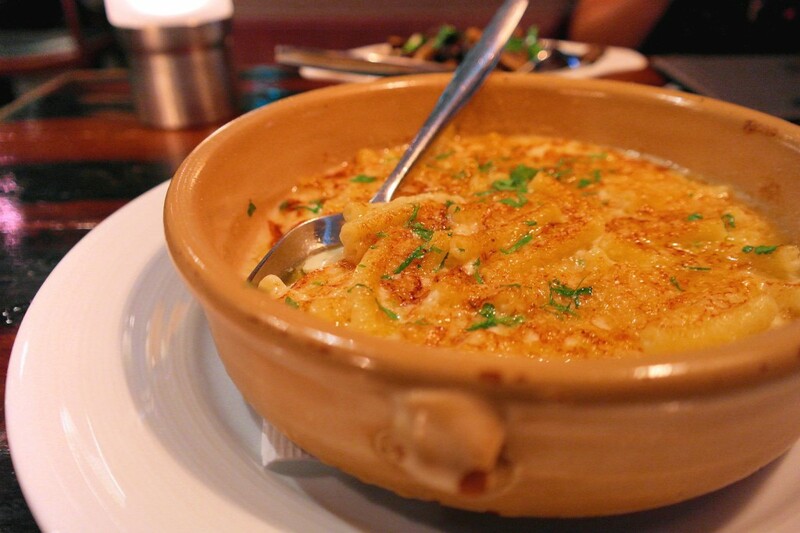 Made with beef broth and gruyere gratin, even though it was very thick with ample onions, the soup was heavy in sweet flavour and not overly tiring. 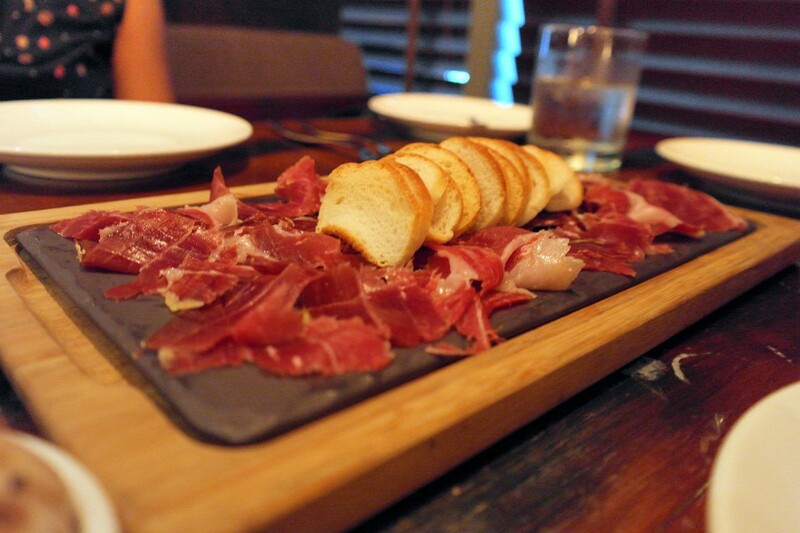 Jamon ($49). Shaved jamon iberico de bellota from the 5J (Cinco Jotas) brand, this is one of the most prized and highly awarded jamon in Europe. Bedrock mac n’ cheese ($18). 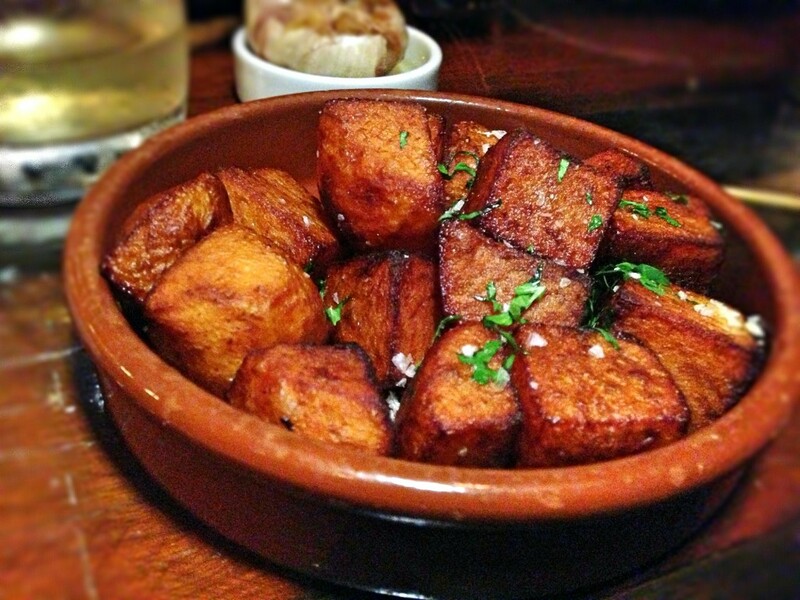 Hidden in a smaller corner of the menu, this is a very underrated side you MUST try. Made with Italian Maccheroni and 4 different cheeses including blue cheese, there’s a nice grilled cheese crust that opens into a flavorful, thinner macaroni that allows the cheese to have more contact with. Surprisingly not overpowering in cheesiness either. Duck Fat Potatoes ($15). This was probably one of the few unimpressive dishes I’ve tried here, along with the Heirloom tomato salad ($20). Lacking in duck fat fragrance and a semi-hard center. 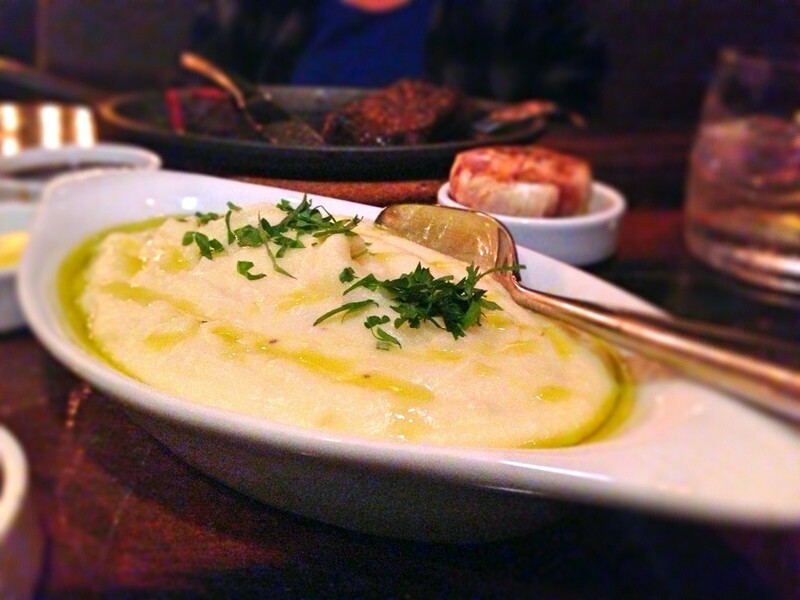 Truffle Mash potatoes ($15). Smooth with no hint of bits, and very creamy with that distinct truffle oil layered on top. Mix the oil in well for a savoury mash. 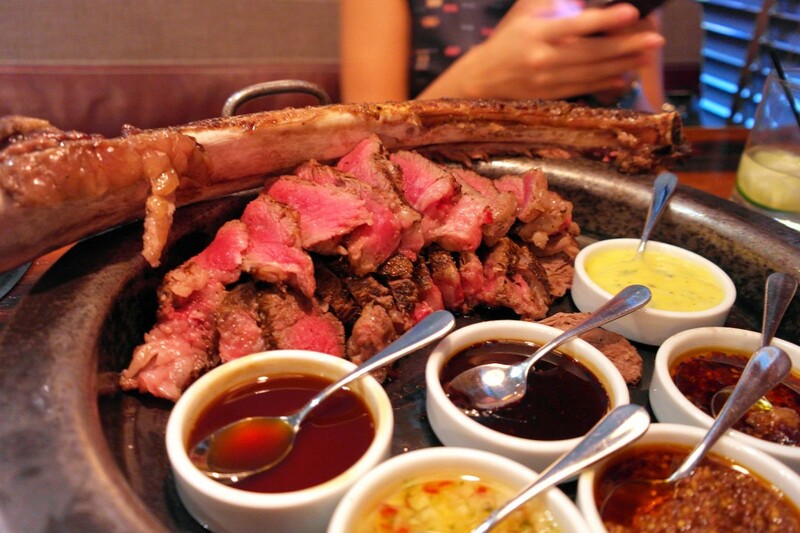 After the starters and bread, the steaks arrived served on a hot plate to keep the meat warm after resting. A good restaurant is observant and always serves dishes after the prior dish has been finished and cleared. Bedrock Black Pepper steak ($79). This steak uses the ‘cap of rib-eye’ (or spinalis dorsi for the geeks), a true blessing from the hall of the cow Gods. Located -around- the meat of the rib-eye, this purist cut has the combined flavour of a rib-eye and the tenderness of a tenderloin. This cut has the best balance of any other cut I know, and not many steakhouses in Singapore serve this rare delight as the remaining rib eye portion after taking the cap is quite wasted. Simply seasoned and char grilled, this meat truly shines by itself. I’m truly amazed how Bedrock grills its steaks so evenly throughout the entire meat, and still retaining that awesome charred outer skin. The thick, spicy black pepper sauce on the other hand, was as disappointing as an Asian getting a B in his exam.Personally, it tasted akin to bottled Lee Kum Kee black pepper sauce. We didn’t really use the sauce at all, for the rib-eye cap was by itself as beautiful as looking at a new-born child and naming him Simba. Then eating him. A preview of what’s being served next. Hope you’re feeling very hungry. Tomahawk Steak (market price). 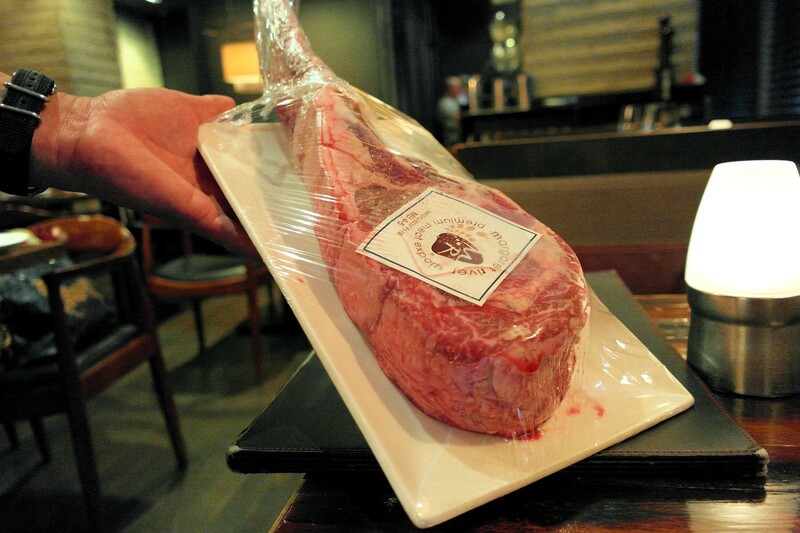 A 400 days grain-fed wagyu bone-in monster. 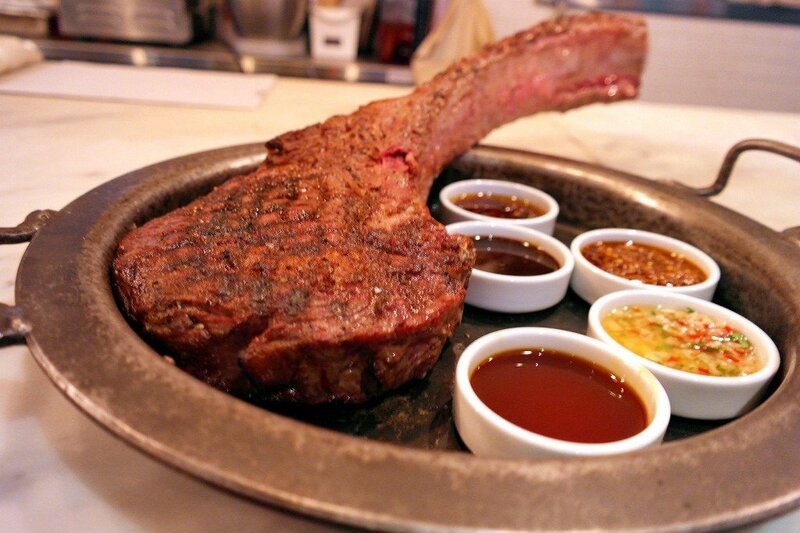 Did you know Bedrock was the very first restaurant to bring in the impressive tomahawk steak? Soon after, many restaurants followed in as well. Imitation is the highest form of flattery after all. They’ll cut it up for you, don’t worry. This tomahawk was about 1.6 kg including the bone, and will set you back probably $200. Comes with five sauces: red wine sauce, bedrock chili oil, classic béarnaise, wholegrain whiskey mustard and chimichurri sauce. This was truly a multi-taste experience, with the outer flesh having a more charred, burnt finish, while the middle and inner bone parts are juicier with more flavour from the bone roasted in. Mix in the sauces and your taste buds will be kept entertained the entire evening. A bit of everything for everyone. I recommend at least have 3 people to share this if you want to have room for anything else. 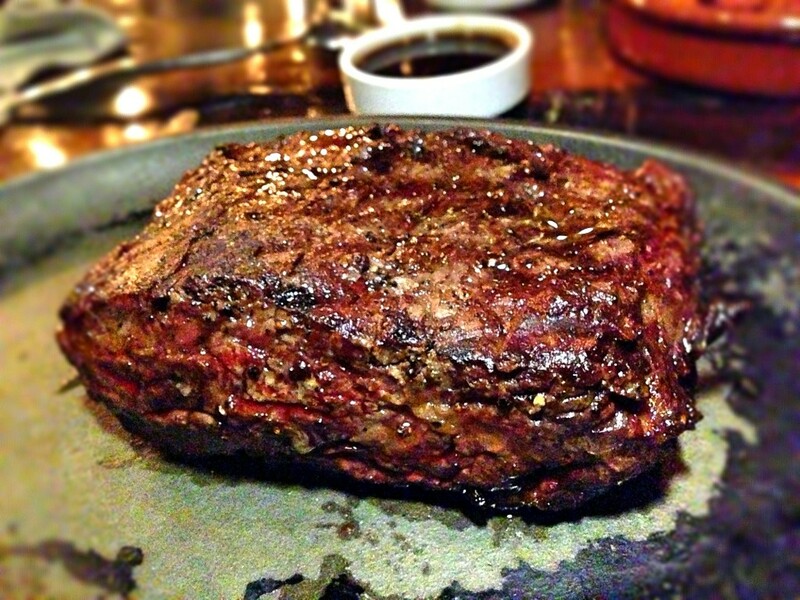 I also tried the USDA Prime Black Angus tenderloin ($89), with a marble score of around 4-5. This steak figuratively blew my mind with how tender and soft the meat was despite being so lean. 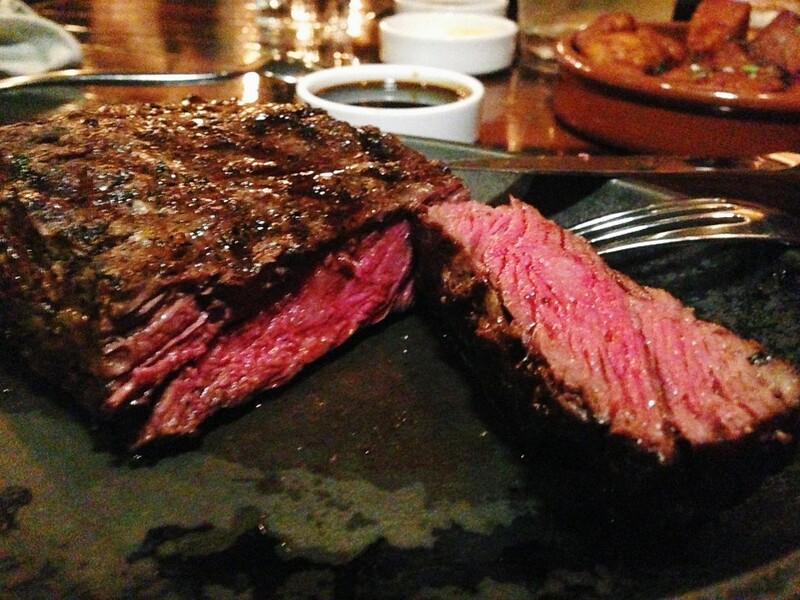 This steak had all the buttery, juiciness of greatness. I usually find tenderloin’s too lean, but this was still so full of flavour. Topped with pan-fried Foie Gras ($18), the fatty umami-ness might have been a bit overkill at the end as I struggled with fullness, ‘jelat-ness’ and gluttony. 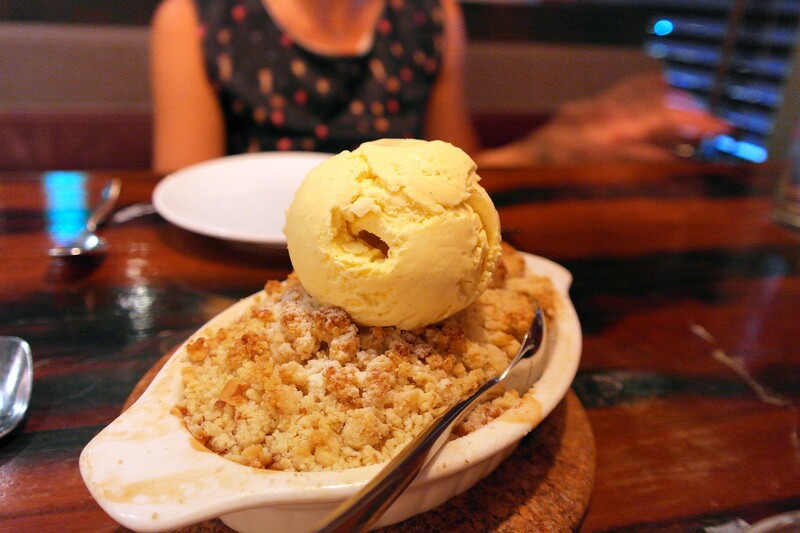 Apple Crumble for 2 ($25). Baked apples, walnut infused streusel (crumbly topping) with vanilla ice cream. Excellent dessert to finish the meal, with a homely warmth with each bite. A mix of sour, sweet and varying textures and temperatures. The Whiskey Trail ($56). Taste of the world series. From left: Lagavulin (16 y.o), Yamazaki (18 y.o), Red Breast (12 y.o), Basil Hayden (10 y.o). With 20 ml per shot, I recommend taking this straight, or request for a very small cube of ice. Having the whiskies with whole cut ice dilutes the flavours too much. 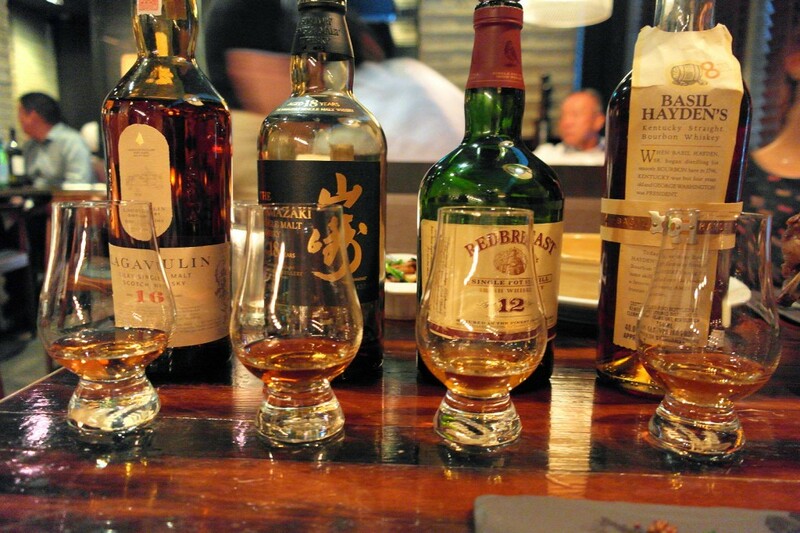 For a unique whiskey tasting, this is the selection to go for. Smokiness in the Scotch Lagavulin, subtle aroma but strong flavour in the Yamazaki, rich and spicy in the Red Breast and a light, sweet bourbon from the Basil Hayden. It’s truly a whiskey drinkers oasis here. As you’ve probably figured, good steak is 80% origin and type of meat used, 20% cooking technique. 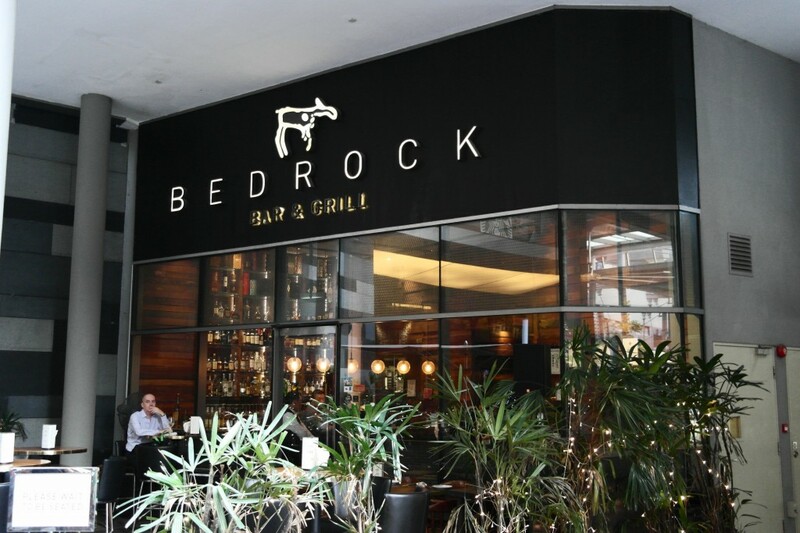 Bedrock Bar and Grill has managed to bring out the full potential of a grilled steak and is definitely one of the best steakhouses in Singapore, although the price for quality is a steep one here (not as steep as CUT by Wolfgang Puck though). Highly recommended for special occasions, impressing a lady friend or for steak junkies. Bedrock Bar and Grill is on the Entertainer App, which gives you 1-for-1 dining vouchers at hundreds of restaurants like this. Read my Entertainer post to find out more.